As move-in 2017 is in high gear on the Appalachian State campus, Chancellor Sheri Everts has released a statement to set the tone for the new school year. Her full statement is below. Today, we can all revel in the controlled chaos of move-in and look forward with great expectations to this Fall 2017 semester. In the days ahead, I will share with you a list of things to celebrate and embrace at Appalachian. But for now, on my mind – and likely on yours – are the recent events in Charlottesville, Virginia, and their aftermaths. While no single message or interaction can suffice as a response, I affirm that there is no place for hate on our campus. Members of our Appalachian Community will stand together against violence, discrimination, injustice and racism of any stripe. And, through discussion and discourse, argument and exchange, our campus community can find common ground for addressing difficult social and intellectual issues. I would ask each of you to consider how you can share in this collective responsibility, because it is incumbent upon us all to find ways to make our community one that offers every member the same opportunity to thrive. Together, we can make this campus a source of innovative thought – a place that embodies inclusiveness and embraces sustainability. We can be a model of justice and fairness. Our message is simple. 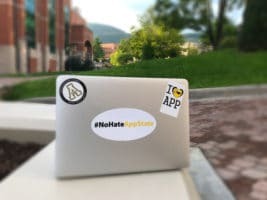 No hate at App State. Pass it on.